Celebrate Halloween, Dia de los Muertos (or Christmas?) with the Pumpkin King himself. The one and only Jack Skellington. Quick and easy to make but SO effective these Vegetarian Mexican Quesadillas are sure to be a spooky sensation. I feel like I'm running out of time. Halloween is looming and I still have recipes that I want to share with you. Admittedly some of them are still in my head but some have actually been made, eaten and photographed. 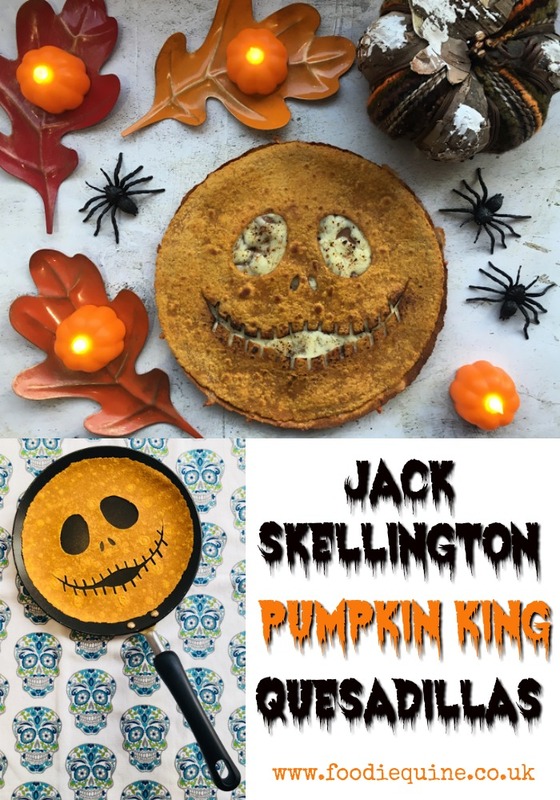 Today's Jack Skellington Pumpkin King Quesadilla is more of an idea than a full blown recipe but I'm so chuffed with how he turned out that I'm going to share how I made him. No need to make it like Jack - you could easily carve out whatever you like on your Quesadilla - just like you would on a real life Pumpkin. He would also work really well for any Dia de los Muertos - Day of the Dead celebrations. There's always a wee bit of discussion in this house as to whether The Nightmare Before Christmas is a Halloween or Christmas Movie. I reckon it counts as both. If for some reason you have absolutely no idea who Jack Skellington is then I'm afraid we can no longer be friends. Seriously if you don't know it, do check out the 1993 film. Quick synopsis is that Jack is to Halloween what the Easter Bunny is to Easter and Santa to Christmas. As the Pumpkin King he's MC for Halloween Towns annual celebrations however he's becoming somewhat depressed about his role and decides that instead he'd like to be Sandy Claws. Cue much shenanigans including bogeymen, unrequited love and mortal peril but it all works out for the best in the end. I used Sweet Potato tortilla wraps to make Jack but you could easily use standard ones. I've also recently spotted fantastically coloured Beetroot and Spinach wraps in the supermarket which would also work really well for this. To make Jack I used a Jack Skellington Stencil from Pinterest. I had to scale the size down a wee bit on my printer/copier to get it to fit on the wrap and then cut out the shape using a combination of knife and scissors. There are loads of great pumpkin stencils out there which you could use or just go freehand. 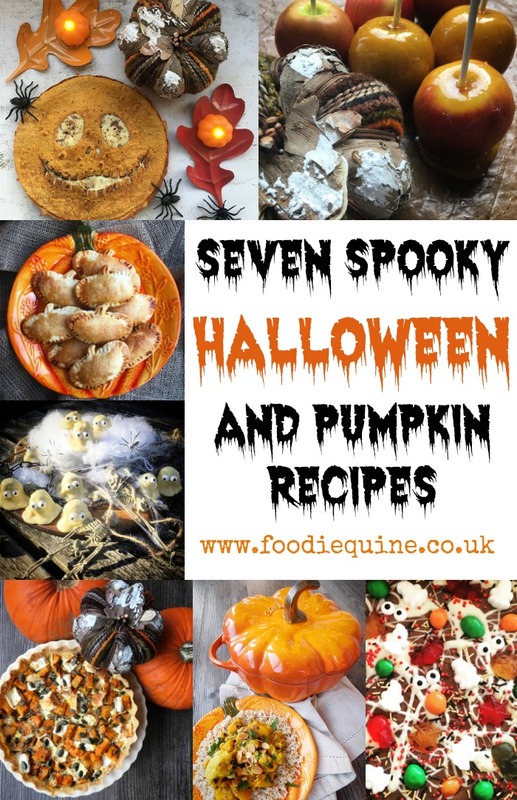 In addition to my Jack Skellington Pumpkin King Quesadilla 'recipe' I'm also going to take the opportunity to re-share some of my other Halloween recipes with you. 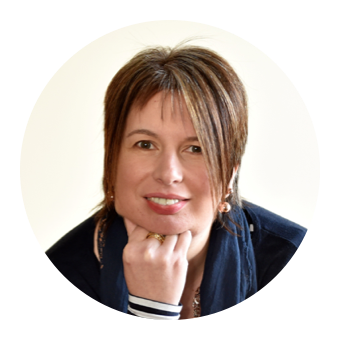 Please do tag me @foodiequine or #foodiequine if you make and share on social media. To serve - tomato salsa, jalapenos and soured cream. Dry fry 'Jack' on both sides in a frying pan - a crepe pan works well for this - until crispy. Set aside and dry fry a second wrap. Warm through the refried beans in the microwave. Spread the refried beans over the uncut wrap and top with a generous handful of grated Mozzarella. Sprinkle with smoked paprika and/or chilli flakes to taste. Melt the cheese under a preheated grill and top with the 'Jack' tortilla to make a Quesadilla. Serve accompanied with tomato salsa, jalapenos and soured cream. Wow! They look amazing and your carving is so neat! These look so much fun. I must use pumpkins in more recipes.